So, as I was looking through TMS archives to find an inspirational post, this one for Rosemary's Fabulously Red Lady Skater caught my eye. 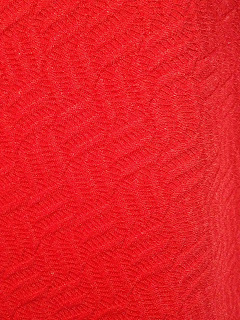 It's a solid color, it's my favorite dress pattern, it's red, which I've traditionally avoided wearing, but lately have been told I should wear it more often. So that seemed like a perfect dress to copy. Especially since I even already had fabric on hand. 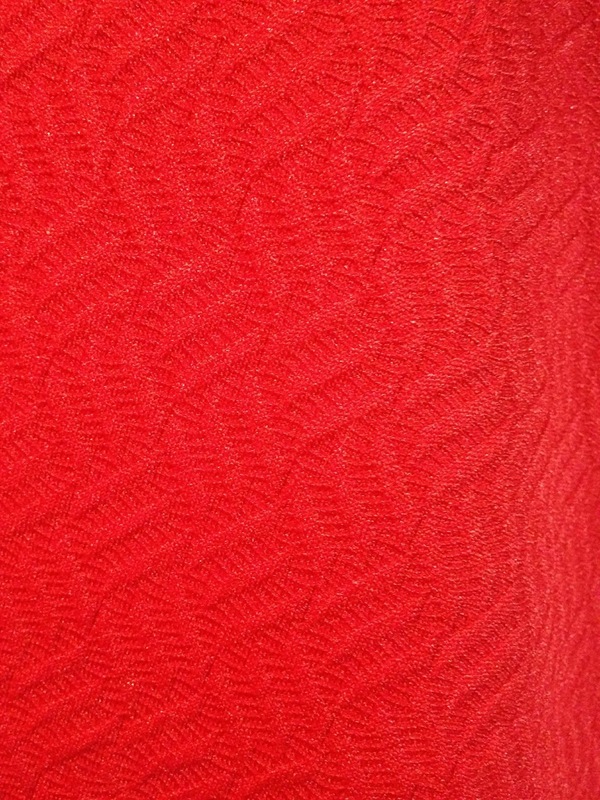 I had recently picked up some Rose Red Poly/Lycra Abstract Jacquard Double Knit from Fabric Mart with the intention of making myself a red dress. And here's a photo I took of it to show off the texture. I've made the Kitschy Coo Lady Skater several times, but I tried something a bit different with this one. The fabric is a bit scratchy, so I decided to line it with something that would feel better against my skin. 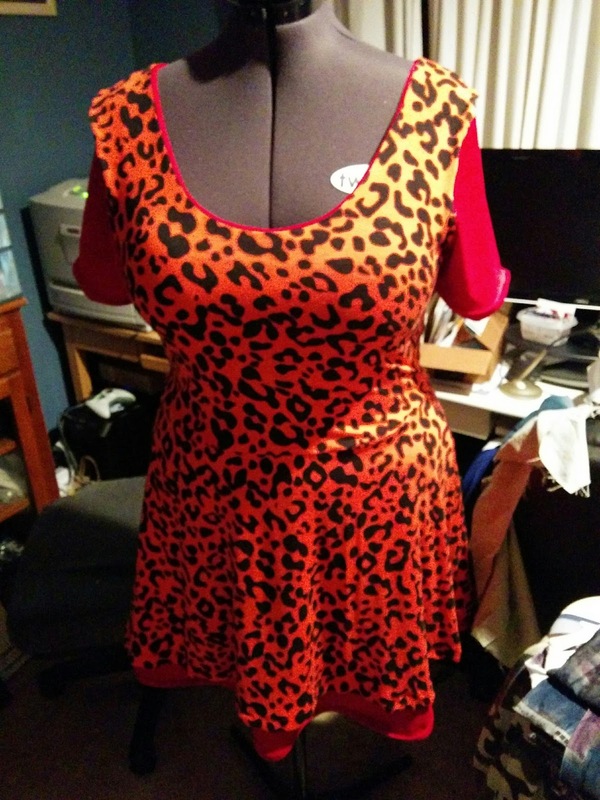 So I chose a very soft black and red animal print rayon blend jersey that I picked up from a flawed fabric bargain lot from Girl Charlee. 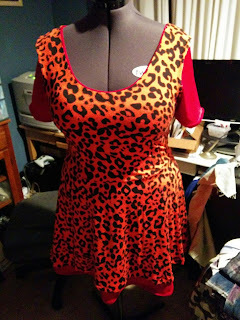 At first I only planned to line the bodice, but as I was constructing it, I thought about how the waist seam would end up being itchy and the dress being on my legs sitting at my desk all day might bug me too, so I cut the skirt pieces too. I sandwiched the pieces together at the waist seam, as I did with the plaid version I made at the end of last year. I didn't line the sleeves, but my insides were looking so good that I thought maybe I would try a French seam to attach the sleeve. This red fabric is pretty thick, so both of those plans were just terrible ideas. Granted, I didn't clip the curve of the sleeve seam, but still, the thickness of the French seam made the shoulder look bumpy and very bad. Luckily, I only did one before I realized it was a mistake. As for the waist seam, I just felt like the seam was too visibly bulky with all 4 fabrics joined together like that, and all 4 steam allowances all bunched up together. So I started ripping out seams. Which added a week to this project. 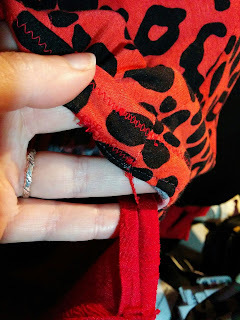 Mostly because I pouted some for a while at the fact that I had to do so much seam ripping and also because the lighting in my comfy spots are terrible for being able to rip out stitching that so closely matches the thread to the fabric. But I did find some daylight times to be able to do it eventually. Once I reassembled the dress with the lining hanging completely separate, the dress looked so much better constructed than it did previously. And I just love how it looks on the hanger with the black and red animal print peeking out. 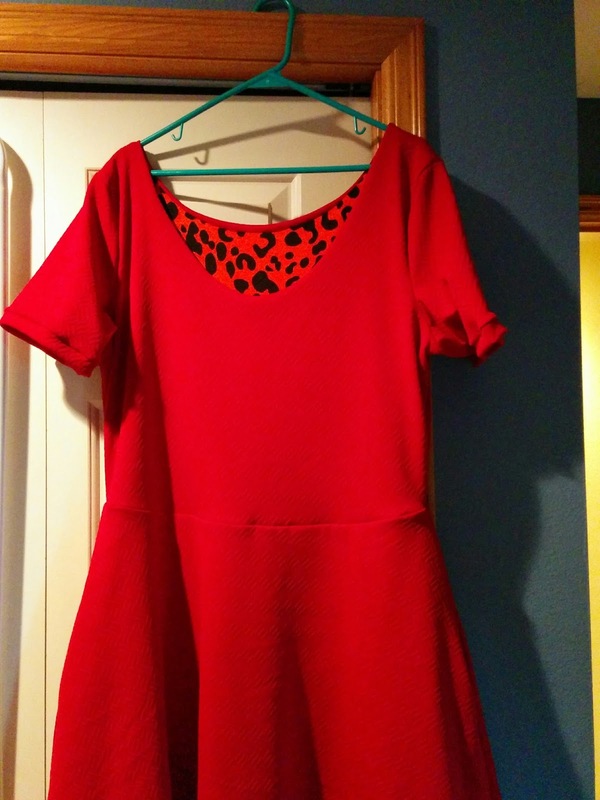 Here's the finished dress inside out on my dress form. I even added French tacks to keep the lining from shifting around too much. I followed this tutorial from Ohhh Lulu. And here I am wearing it out in the driveway. 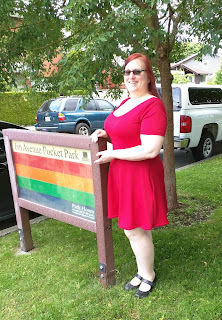 My husband and I walked down to the park at the end of the street to take these photos. Not many turned out very great. Here's me doing my best Vanna White impression. And this one was me trying to act shocked in response to my husband making some crack about how he's stalking me in the woods. My new glasses have transition lenses, so I don't really notice them changing and am always surprised to see I'm wearing sunglasses in my photos. haha.